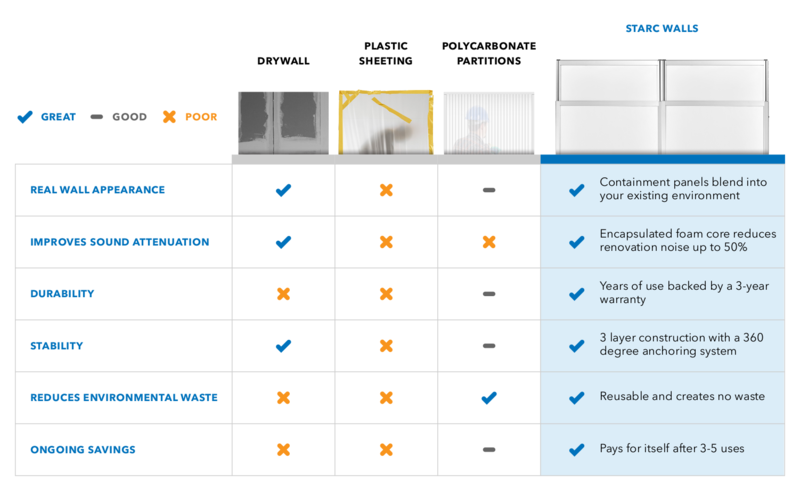 Stocked and available through HEPACART®, STARC® Systems is a simple, easy to use, and environmentally friendly alternative to other temporary dust containment options. The airtight walls can be configured in virtually any shape while the telescoping design ensures an airtight seal, no matter what the shape or size of the contained space. Plus, the panels are completely reusable and easy to sterilize, which means you can use them time and time again. The STARC® Systems solution is a fast and reliable solution to containment, infection control, and noise complaint issues. HEPACART® carries STARC® Systems because it holds true to the HEPACART® promises of durability, productivity, ease-of-use, sustainability and professional craftsmanship. STARC® Systems is literally twice the modular wall system compared to anything else in the market. 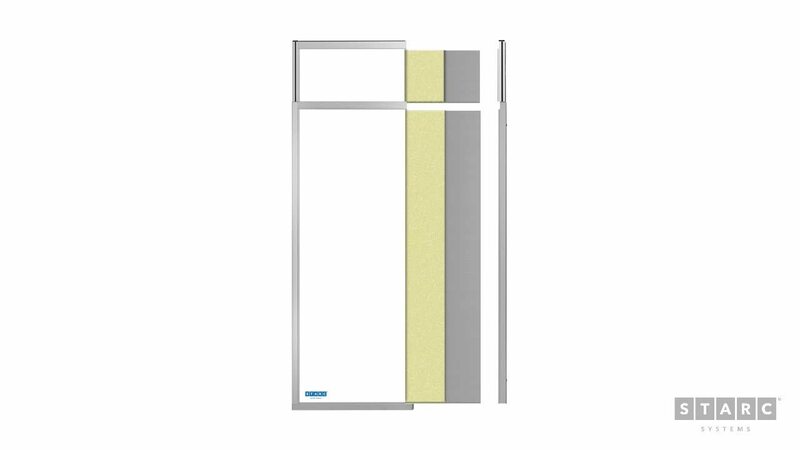 It is the only true wall system with front powder-coated white aluminum and back galvanized stainless steel. In the middle is an insulated urethane foam core. All of this is supported by a durable anodized aluminum frame. The unique insulated urethane foam core provides a 25 decibel sound reduction from the construction activities occurring behind the wall modules to the occupied patient areas on the other side. You crews can work longer hours and more confidently, knowing they are not negatively impacting patient satisfaction. The unique lift-mate drop connection system and standardized interface of STARC® Systems makes installation easy and efficient. With experience, your team can install 100 linear feet of STARC® in an hour. 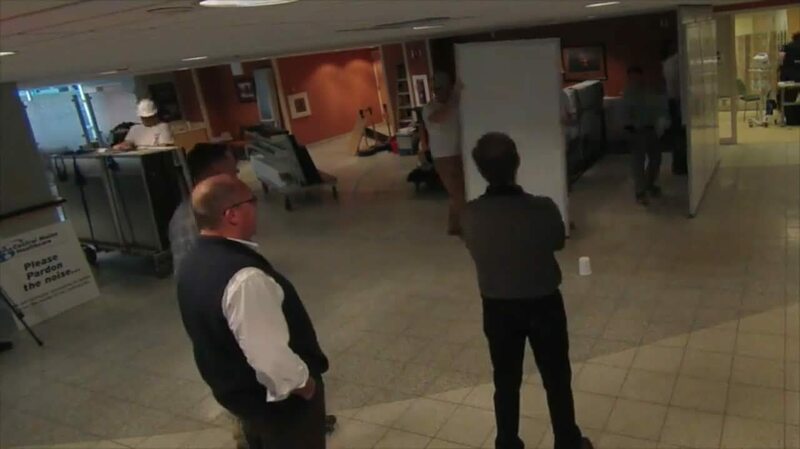 You can watch that video here: How long does it take to assemble 97 ft. of STARC®. With four different panel sizes, air panels, swinging and sliding doors, flexible corners and wall interfaces, STARC® Systems can tackle projects of all shapes and sizes. Zero to ninety degree flexible corners allow the ability to make any turn. Filler panels allow STARC® to work around wall obstacles. Each component of STARC® Systems telescopes to reach the ceiling. There is not stacking nor hardware necessary. A simple wrench (included) tightens the panels once in place and they are secured by grid-clips to the ceiling. Industry leading warranty for peace-of-mind. STARC® Systems Exceeds ICRA Class IV Requirements and is Durable Class A Rated. Used exclusively by some of the largest healthcare companies and contractors in the U.S. dedicated to a better experience for patients and their crews. Get an overview of the features and benefits of the Starc® Systems product. to assemble 97 ft of Starc®? Watch this video and contact us for more information on all sizes and components available exclusively through HEPACART®. The HEPACART® mission is to develop productive, durable, job-flexible, safe and sustainable containment solutions that protect patients from dust and pathogens in healthcare and other high-risk environments.